This November, Sharjah Art Foundation launched its Music Programme, which will bring year-round events including concerts, workshops, open mics, discussion sessions and more to local and regional communities. The Programme’s launch began with the residency and concert of the music and film ensemble El Foukr R’Assembly, its members hailing from Algeria, Ghana, Burkina Faso and Ivory Coast. From 13-17 November, the band conducted workshops with the public on topics ranging from oral storytelling to musical arrangement. Their week-long residency culminated in the band’s GCC debut concert on 18 November in Mirage City Cinema, Al Mureijah Square. 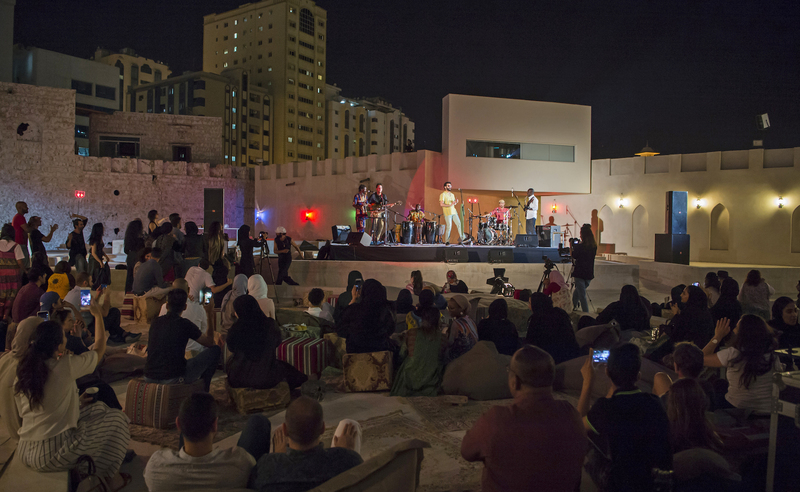 On the concert’s occasion, Sharjah Art Foundation’s outdoor spaces around Al Mureijah Square hosted a number of interactive activities along with food stalls set up by local vendors, followed by the band’s live performance. Among the activities were workshops for children and adults of all abilities, including Expressive Painting, Bookbinding, Making Handmade Instruments and Capoeira, an Afro-Brazilian branch of martial arts that combines movement and music. The workshops collectively gathered over 100 participants. The concert opened with performances by five UAE-based artists, showcasing pieces they had respectively arranged throughout the week of workshops with the band. Members of the band joined the performers onstage for each of their diverse pieces, with styles ranging from blues to spoken word to traditional Middle Eastern music. Afterwards, El Foukr R’Assembly’s set began. The band performed songs blending genres such as Algerian Rai, Saharan Sufi, Ghanian High-Life and Burkinabe Mandingue. The energetic, trans-Saharan groove act gathered an enthusiastic audience of over 250 attendees, many of whom danced throughout the entire show.